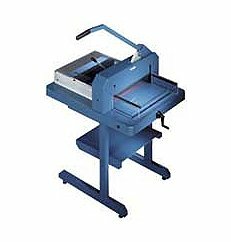 The Dahle 842 is a 17” wide heavy duty stack paper cutter for quick and accurate sizing of all types of paper and card stock. This spindle driven, paper cutter is perfect for the in-house print shop or high speed printer for processing short runs. There is millimeter accuracy which is guaranteed by the spindle driven back-stop with a scale-bar in both inches and centimeters. There is also a quick action clamp which holds work securely and evenly across the entire cutting surface. The Dahle Professional Series Model 842 is a 17″ Paper Stack Cutter that cuts a stack of paper as thick as about 200 sheets cleanly and evenly. A safety shield is featured on both sides of the cutting blade and will not allow the blade to move while they are in the up position, providing the optimum safety for the operator. The Dahle Stack Cutter can be mounted on any secure table surface and there is an optional floor stand also available. Dahle Stack Cutters are manufactured for strength and reliability and can be found in art departments, custom frame shops, and print & copy centers throughout the world. If you have any questions or are interested in purchasing the Dahle 842 Professional Stack Cutter, visit us at SpiralBinding.com. We have great pricing on a full line of Manual Paper Cutters. Call us at 1-800-631-3572 for more information!